I was inspired by the Anatomy of a Usable Website, and decided to make a similar guide for a product page. I had previously written a post regarding product descriptions, which still apply here as well. 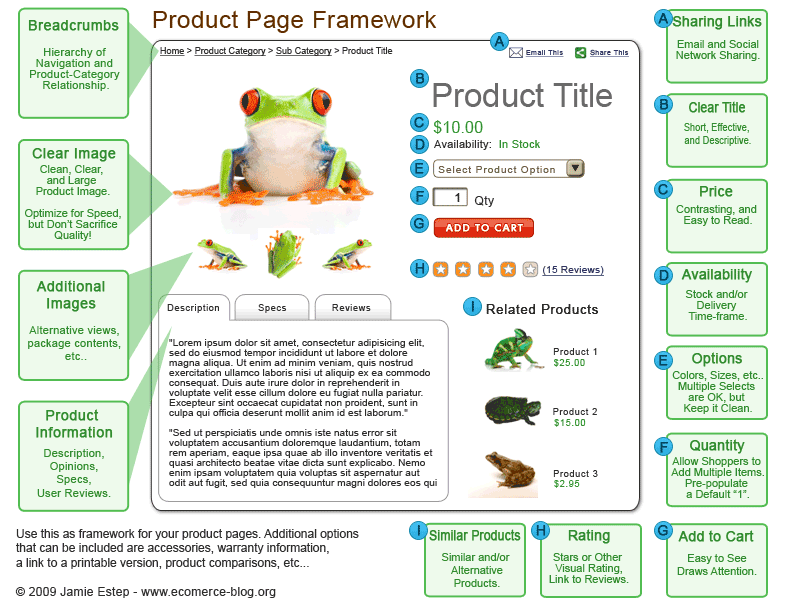 This is meant to be a framework for creating an ecommerce product page. There are of course many additional things that could be put on a product page, but these are the essentials that every page should have. 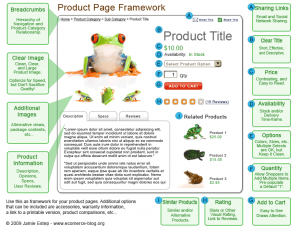 The more features that a product page has, the more likely a user won’t notice them. In the end, websites benefit from clean and well organized content. Looks interesting usefull to show clients to start the ball rolling. Do you consider related items the same thing as similar items? If so does having it all on the product page help or hinder call to action by presenting the customer with too many options? Great Post Cheers. I do consider them to be the same thing. I think it’s important to present them in a way that it doesn’t distract from the product itself. The goal of a product page is obviously to sell a product, but the similar products are important because it’s possible that a customer doesn’t know what they are actually looking for. By presenting those customers alternative options, based on some logical association, we can improve our overall conversion ration, and prevent our customers from having to go through excessive searching on their own. this is a really great design for a product page. Nice, clean simple and easy to navigate. So many times e-commerce sites tend to get bogged down with too much content. This will deter people from purchasing on your website.